I also changed the room score so that using multiple overlays will not inflate the room score. And, the files are a bit smaller now, without the above unnecessary garbage. The GUIDs are the same, so please do not keep both meshes in your game; all recolors will still work. This is the final edition of my Great Wall Project. If you missed any of the previous four installments then Where were you! He, he, he, kidding... just kidding. Seriously though, if you missed any of it, please go check my profile - or follow the links at the bottom of this post - and catch up! My wall catalog looks so much nicer now. Oh my! These are Wall-Overlays; cloned (and changed by me) from Pixelhate's Recolourable FullPoster "Wall Overlay - Wall Animation". Please see his post for more details. 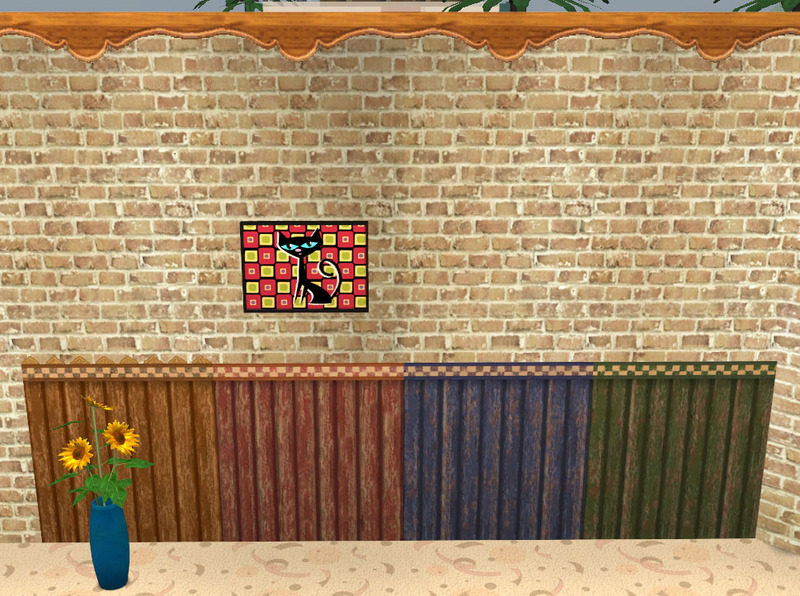 ~This is a full height 1-tile poster with Maxis recolors. ~The Mesh is static; it has its own GUID. ~The polycount is minimum: Faces: 2 Vertex: 4 - The smallest possible object! ~It is base game and EP compatible, thanks to Numenor. ~And, it can either be found under the Build/Architecture tab OR in your Deco/Misc category, depending on which mesh you choose. If you do not have the Architecture tab in your build section (it came with one of the 2 last EPs) then PLEASE get the mesh marked Deco/Misc! 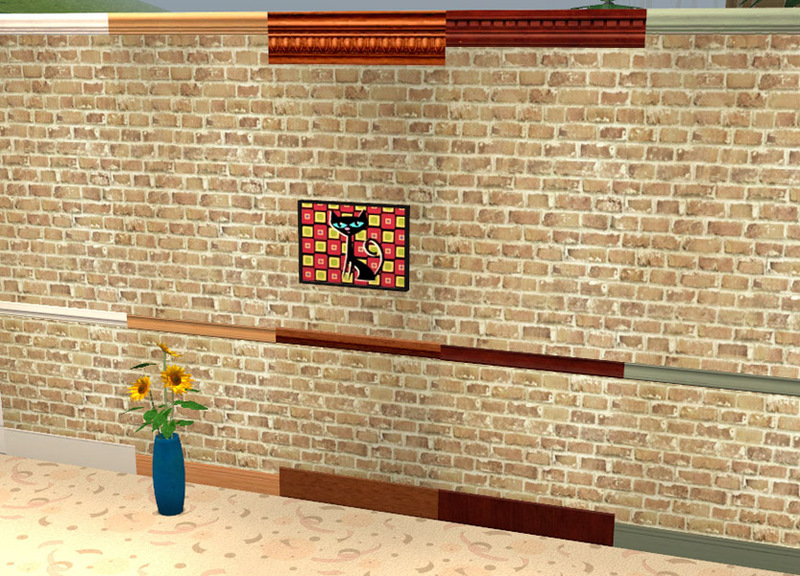 These overlays are all reconstructed versions of EAxis walls from all the combined EPs and SPs - however, they are base game compatible. You do not need the EP/SP to use these in game. They are usable with ANY wallpaper/texture you choose. I've made them continuously placeable - useful when doing a whole room. They work with windows and doors (etc.) 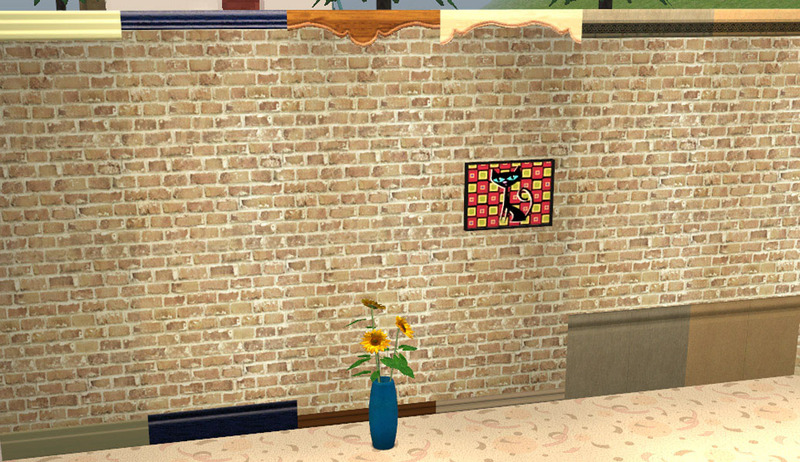 - your sim will walk right through them like they aren't even there - the door will function exactly as it should. Pictures and other wall deco can still be hung. 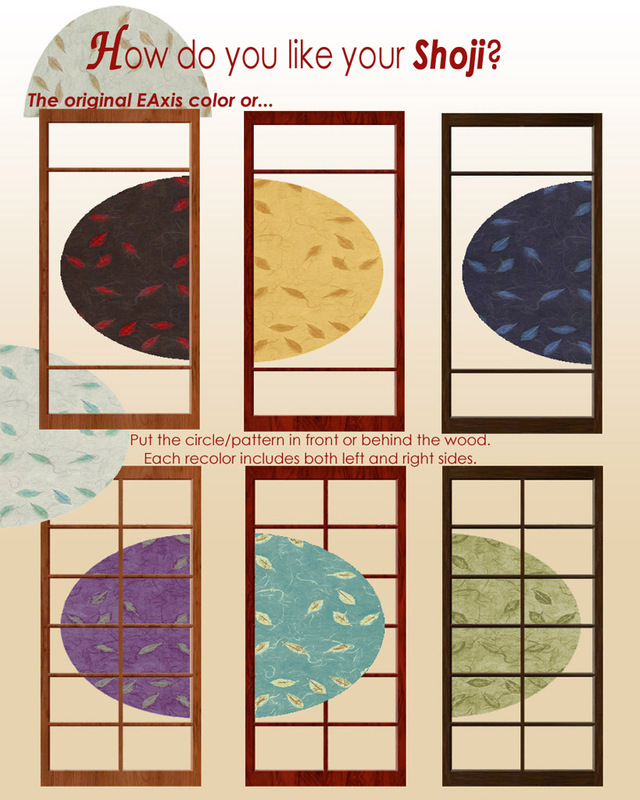 One peculiar note: if you are using a 'full' wall overlay (like the Shoji Panels) a door or window will not 'cut out' through the overlay. The sim will still walk/see through it, but it may look a little funny to you when they walk right through the design. Or, this could be an advantage... a secret passage maybe? They are layer-able; so you can mix/match for maximum designerability with minimum catalog space usage. IE: With the Crown, Chair, and Kick series you can choose to use just one rail, two, or all three at the same time - you put them together the way you want them! (Why have 6 versions of the same wallpaper? Oi!) When overlapping layers you will need the "MoveObjects On" and "snapObjectsToGrid false" cheats. NOTE: the only way I could make diagonals work without stretching the texture, is by layering. This can be a bit finicky at times - especially with different camera angles - but keep fiddling with it and you'll soon get it right. 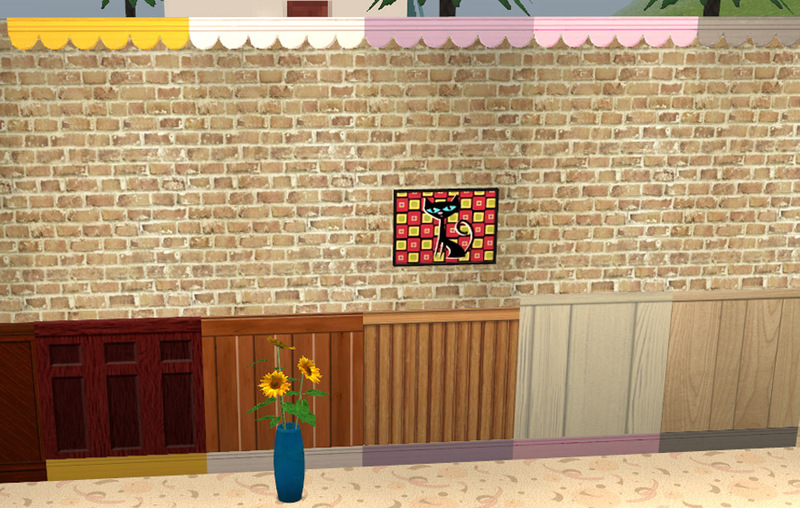 Now, for me, the REAL beauty of these overlays is that my wall catalog is finally maneagable. Which brings me to mention my nifty-gilifty Maxis Wall Hiders. (OCD? Who, me???) Don't forget your Hiders! 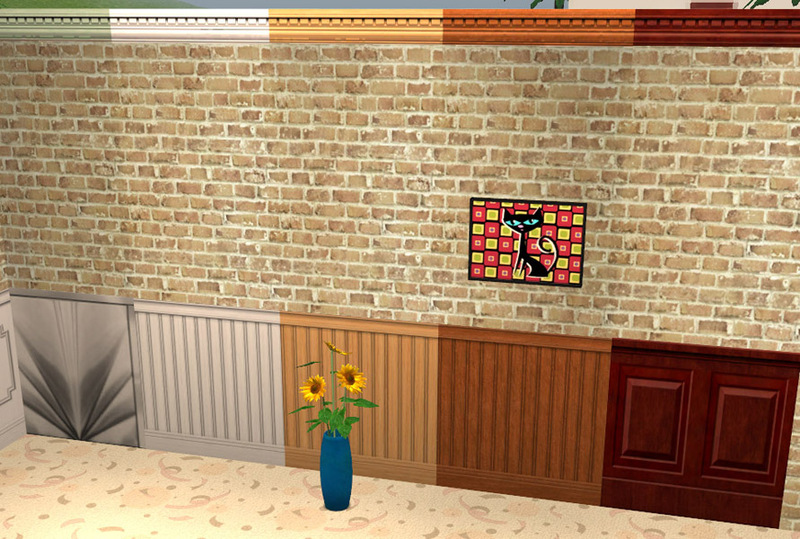 With these Overlays you no longer need the corresponding Maxis walls cluttering up your catalog do you? I don't! Everything is clearly marked in the Hider package - and you can easily delete* a hider file for any wall you really want to keep. The hider file is safe for use in any game configuration. *To delete a wall's hider file, open the hider (.package) with SimPE, find the name of the wall you want to keep, right click it, choose 'delete' from the dropdown menu, SAVE. Done. Wallpaper Overlays - the Border Edition - all the EAxis borders without their wall baggage! 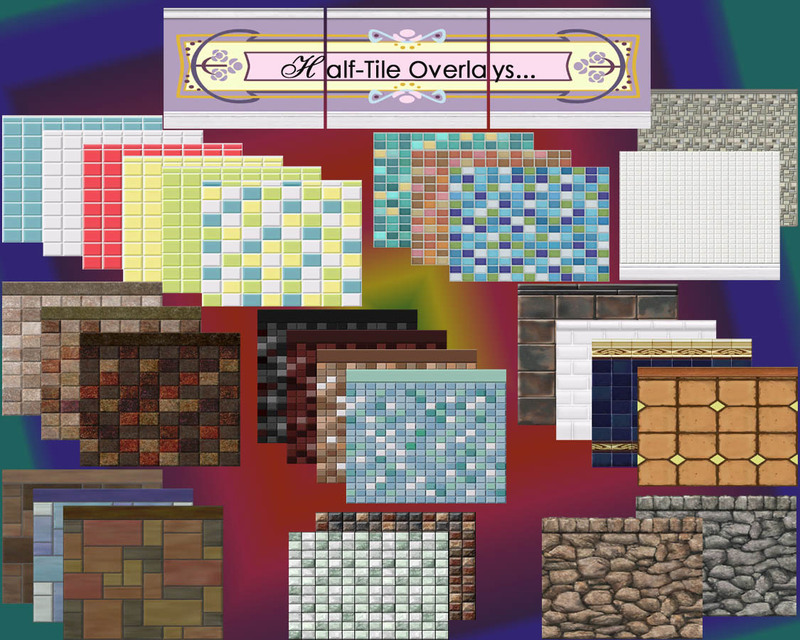 Wallpaper Overlays - the Outside Edition - all the OUTside type wall trims... Tudor Tile anyone? 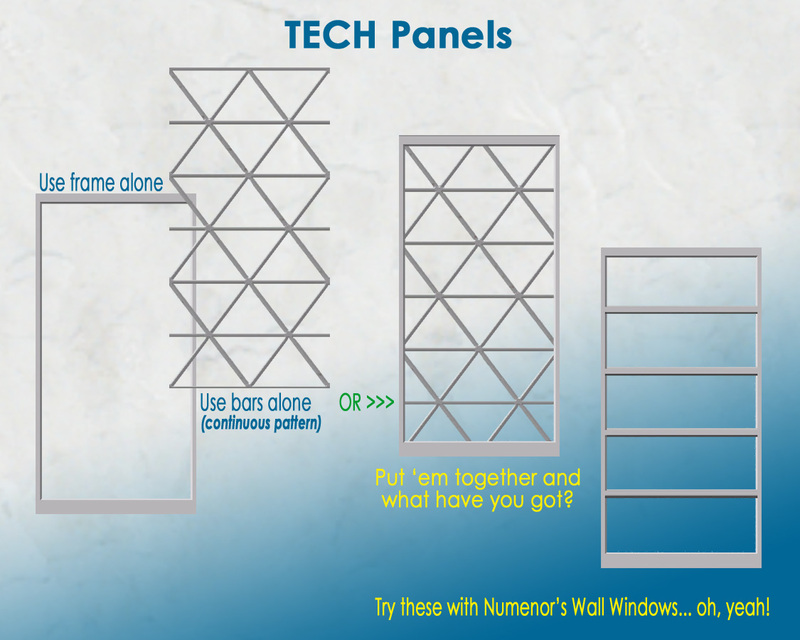 Maxis-Matching Walls: UNTRIMMED - custom plain walls for the few EAxis sets that did not have just "plain". Credit to Pixelhate and Numenor for the idea and original mesh. 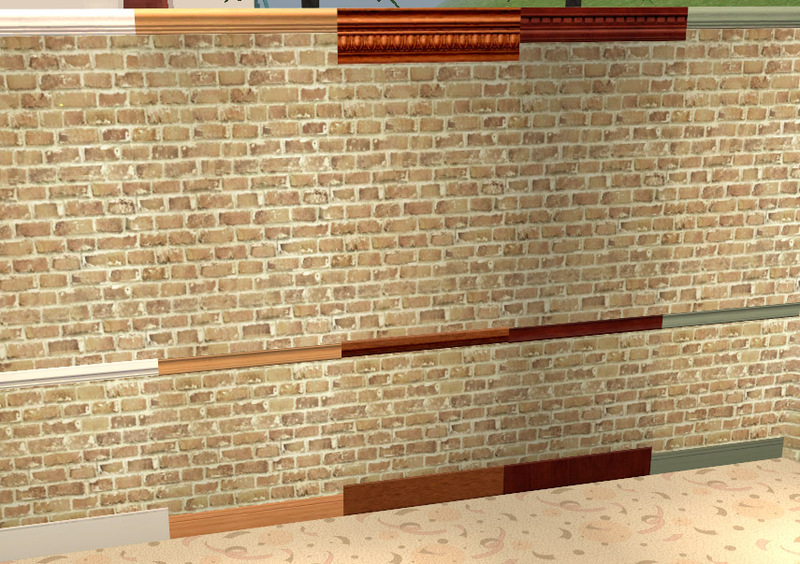 Credit to Maxis for the textures. And a BIG thank you to those who gently nudged me to finally get this done. CatherineTCJD_MESH_INsideOverlays-DecoMisc.rar | Description: OLD mesh! Get the new and IMPROVED version below! CatherineTCJD_MESH_INsideOverlays.rar | Description: OLD mesh! Get the new and IMPROVED version below! PartA-CrownChairKickWain.rar | Description: Crown Molding, Chair Rails, Kick/Baseboards, and Wainscoting. DONT FORGET TO GRAB ONE OF THE BELOW MESHes!!! 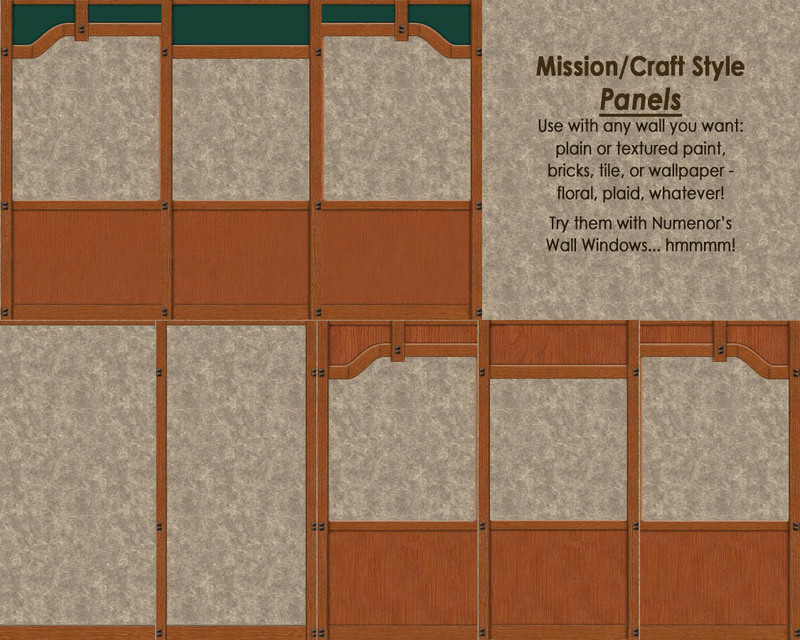 PartB-Panels_FrameCraft.rar | Description: Mission/Craft Style Panels and Framed Panels with painted wainscote. DONT FORGET TO GRAB ONE OF THE BELOW MESHes!!! 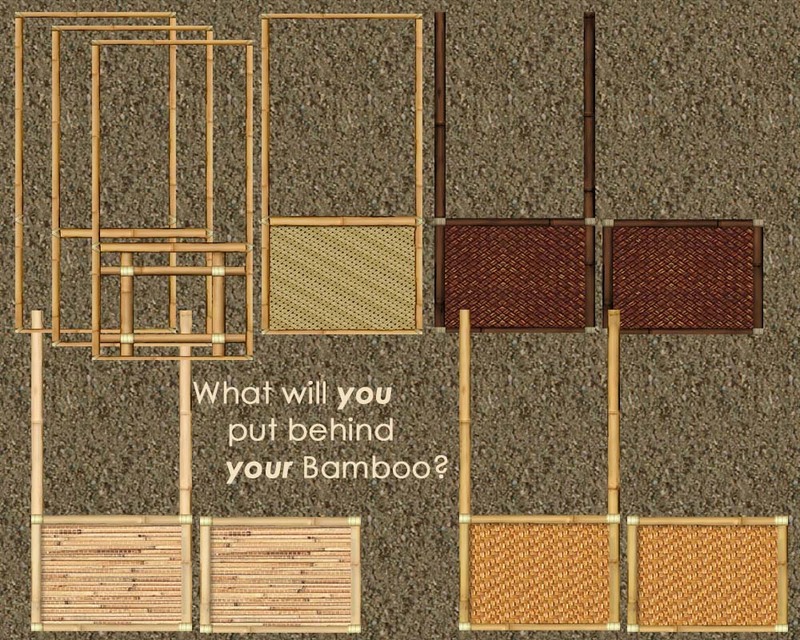 PartC-Panels_TechShojiBamboo.rar | Description: Bamboo Panels, Tech Panels, and Shoji Screens. DONT FORGET TO GRAB ONE OF THEBELOW MESHes!!! 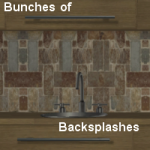 PartD-HalfWallTileRock.rar | Description: Half-wall Tiles and Rocks. DONT FORGET TO GRAB ONE OF THE BELOW MESHes!!! 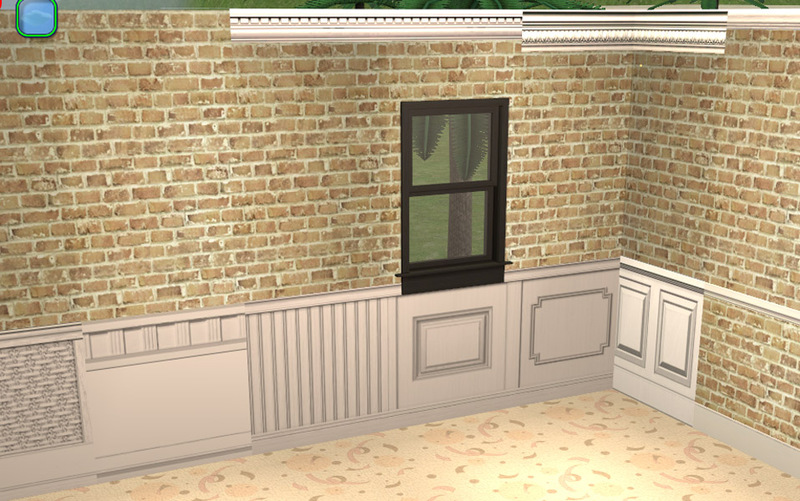 MaxisWallHiders-INsideWoodTrim.rar | Description: To hide the EAxis walls which now have corresponding Overlays. ;-D Safe for all EP/SP configurations! These recolours may or may not be endorsed by CatherineTCJD.